Does Tryptophan Make Me Sleepy? A Look at an Amino Acid with a Bad Rap. If you've ever been to Thanksgiving dinner at anyone's house ever, you've probably heard something along these lines: "I'm so tired because I ate too much turkey. You know, all that tryptophan." 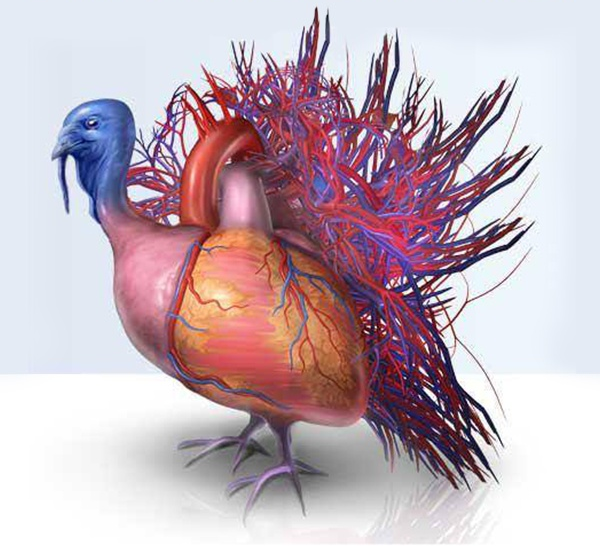 Well, I think it's time you learned the truth: tryptophan is the scapegoat for post-Thanksgiving meal exhaustion. But if it isn't to blame, then why do you want to curl up and sleep for a year after eating all that turkey? There's a very simple reason. No, really! Less harbinger of eternal slumber, more essential building block of protein. 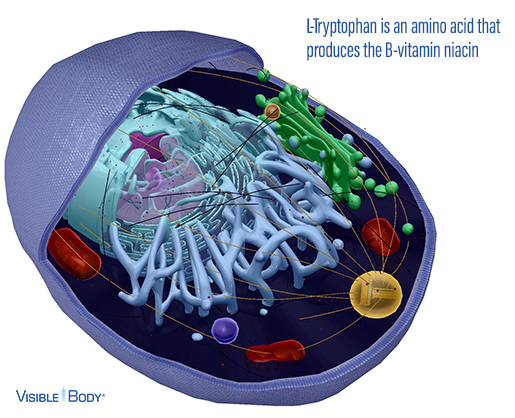 L-Tryptophan is an essential amino acid, but it's not one that our bodies produce on their own, which means we get it through our diet. Believe it or not, you consume plenty of tryptophan on the regular, because it's found in yeast and cereal grains, and in foods like cheese, chicken, eggs, and fish. Oh, and turkey. It's used to produce niacin, a B-vitamin that plays a role in digestion, as well as keeping your nerves and skin healthy. It's also involved in the process of cellular metabolism. But I consume so much tryptophan on Thanksgiving and it makes me sleepy! I hate to be the screen door on your submarine, but there's no more tryptophan in turkey than in any other tryptophan-containing food. And believe it or not, soybeans contain twice the amount of tryptophan found in turkey! You've never eaten tofu and then complained it made you groggy, have you? So then why am I so tired after eating all that turkey? Consider this: you just ate a lot of food. Like, a lot a lot. Thanksgiving is the holiday associated with overeating — I'm 1000% guilty of chomping my way past the point of no return every year — and the grogginess you feel afterward is simply because, to be frank, you've basically eaten yourself into a food coma. According to Dawn Jackson Blatner, RD, LDN, spokeswoman for the American Dietetic Association, "When people overeat, the digestion process takes a lot of energy. Don't incriminate the turkey that you ate — incriminate the three plates of food that you piled high." I'm well-acquainted with food exhaustion all year 'round, so I can confirm this. I've been to BBQs where I've shoved so much brisket down my gullet that I basically have to be carried back to my car at the end of the night. It stands to reason that the same thing happens after I have my 19th helping of stuffing and cranberry sauce (my favorite T-day combo, especially when topped with gravy). When you're reaching for the platter of turkey for the 6th time since you sat at the table, remember not to blame poor L-Tryptophan for the tiredness you feel half an hour later. Instead, be thankful for it! After all, it's helping your digestive system, which will be working overtime this Thursday. 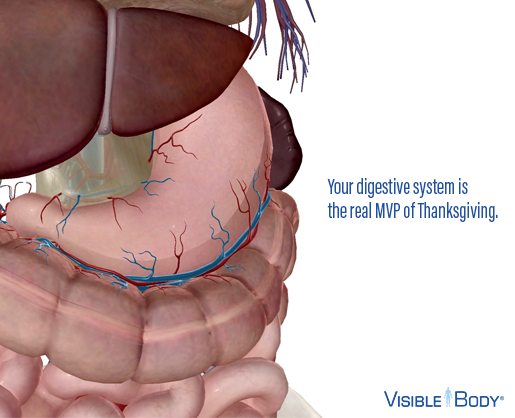 And if you're planning to celebrate Thanksgiving, everyone at Visible Body hopes it's a happy one!